I live in the woods. In a redwood forest. 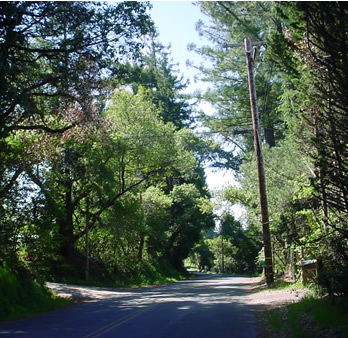 I am driving along the road into the town of Sebastopol this morning. Enjoying the ride. It’s springtime. Flowering trees and green foliage everywhere. It’s a country road, one lane each way. And quite often in my lane there’s no other vehicle either ahead of me or behind me. I have the road to myself. What a pleasure. But eventually, as I travel along, someone does come up behind me. And that person’s preferred speed is greater than mine. I am going too slowly for their taste. They want to go faster than I drive. I have no objection to that. They should have that privilege. I am unintentionally obstructing them. That makes me feel uncomfortable. And, besides, I prefer having the whole road to myself. When I realize that there’s someone driving behind me, whether that person is in a hurry or not, I like to get off the road and let him or her pass me by. Let that driver be happy. And I’ll be happy too because the trip will be so wonderful with the road all mine. So I keep a lookout for a shoulder, a place to get off the road – a wide driveway, a turn-out along the road – where there is good visibility for my follower so that he can safely pass me by. Of course when such an opportunity appears I activate my right-hand turn signal so the driver behind me will know that I am slowing down to get off the road. And then I do get off the road letting whoever is behind me pass by. Sometimes more than one car. When the way is all clear, no one else coming down the road, I leisurely get back on to continue the journey. But, because getting off or onto the road is not a ninety degree turn but only a deviation from straight ahead, my right turn signal doesn’t stop blinking. It continues to flash even as I get back onto the road, still indicating the right turn that I had used to warn my followers of my intention. That’s now a wrong signal because I am, in getting back on the road, turning left, not right anymore. And so my 13 year old daughter, Sadye, who is sitting in the passenger seat, reminds me that my blinker signal is flashing when it shouldn’t be. She says, “You can turn off the blinker now”. I answer, “Oh, thank you.” And I turn it off. I might have said, ” I’m perfectly aware that the blinker is still on. But I’m maneuvering the car. I’ll turn the blinker off when I have a free hand to do so.” Explain myself, in short. Or I could be angry and say, “I don’t need lessons from the passengers. I know how to drive.” Again, defending myself against criticism. But, of course, I don’t do any of those things. Rather, I think to myself, “Here’s an opportunity to give a gift. To let Sadye feel strong. To let her know that her opinions are valued. Let her feel a full participation in what is happening.” So when she tells me to turn off the blinker I thank her for her help. I let her know that I appreciate her keeping me informed. That I have need of her. That she is helping me cope with the world. Would that she, too, exercise that outlook – of not defending herself. Rather just embracing the world. But she is 13. That understanding won’t come for many years. In conversation at a school event next day a neighbor let me know that recently he had been behind me on the road. But he was in no hurry. “You needn’t have got off the road for me. I wasn’t tailgating you”, he told me. He perceived my action – of getting off the road – as a criticism of his driving practice. By arranging for him to pass me, I was deprecating his driving ability. I explained to him that I got off the road for everybody – as a courtesy for them and a convenience for me – with no intention of implying that those behind me are tailgaters. Thus it is that even the most innocent of good deeds proves to be an evil for someone!